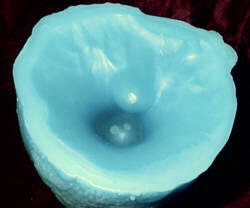 Questions related to wax shrinkage are the most common of all candle making questions. Shrinkage is referred to by many terms including wells, cavities, sink holes, and shrink voids to name a few. Although shrinkage can be frustrating at times, it can be reduced under some conditions. Like most materials, wax expands when heated. In the process of cooling it shrinks back down to its original volume. This shrinkage usually causes a void down the core of the candle, as well as shrinking away from the mold (allowing it to be removed more easily). Generally the larger it is in diameter, the larger the void will be. During the cooling process, holes should be poked alongside the wick. This will help prevent the shrinkage from distorting the wick, and release trapped air bubbles. On container candles it has the added benefit of relieving some of the stress which would pull the wax away from the glass. As mentioned above, without some shrinkage candles would be very difficult to remove from the mold. Generally, the larger the diameter, the more repours will be needed. On most molds, the bottom is actually the top of the finished candle. This makes it possible to refill the shrink void without it being visible (unless turned upside down to see the bottom). After allowing the candle to cool, just pour more wax from the same batch into the void. Be sure to keep the level below the original pour, or unsightly marks will be visible around the base of the candle. Some dyes tend to shift color from heat - this can be reduced by allowing the wax to cool between repours. Allowing the wax to harden fully between pouring will reduce the number of pourings necessary to finish the candle. Pour at the lowest possible temperature. When poured at just above its melt point, wax shrinks less than when poured at higher temperatures. This will cause "chatter marks" on the glass if you don't preheat the molds. This also has the side benefit of reducing scent loss to evaporation while cooling. Use a low melting point wax. Generally low MP waxes shrink less than higher MP waxes. Add a small amount of hot melt glue (HMG). I have heard a lot of claims that this reduces shrinkage, but it is difficult to blend with wax. I don't recommend it, however those who like to experiment may wish to try it. Petro and/or Vegetable Oil used at 10% to 50% do reduce shrinkage somewhat, but I find they cause excessive smoke and soot. Again you may wish to experiment with these and draw you own conclusions. If shrinkage is minimal, a heat gun or small torch can be used to "flow out" the top surface. Shrinkage is a fact of life for most candle making The information shown above will hopefully help you deal with it.